I never thought that I could be happy and uncomfortable at the same time. How do these two feelings even correspond with each other? Additionally, I never imagined myself publishing my thoughts and make them accessible. Here I am dealing with the unfamiliar and unexpected. I welcome you to my startup experience blog. I share insights and personal thoughts while I am building a startup with my fellow students. The last couple of days I was exposed to new situations, unknown environments and surrounded by a huge diversity of people. I study Communication Design & the Creative Economy MA (MACE) at Kingston University London. So here I am…at the end of my comfort zone (with a big smile on my face). I’m ready to step in the rain and discover the beauty of it. I want to push my boundaries and let go of things that are holding me back. I’m aware of the things which stand in my way. Still, it’s uncomfortable to let them go since I have lived with them for a long time. Fear is one of many examples. Everyone has fears but sometimes it’s more convenient to accept a fear than to confront it. I’m grateful that I found this safe environment which allows me to confront my fears. I’m able to grow as a designer and more essentially as a person. I’m happy that I can wake up in London and attend classes with our challenging course leader Janja Song. She explained MACE is not about what we already know, it is about how we think, approach problems and collaborate. It requires to let go old habits and make a step towards the unknown. Every fellow student has another backpack filled with experiences, skills and personality. This creates the perfect opportunity to switch the perspective and develop empathy. We can use the diversity as an advantage and use our equal mindset as the basis of our collaboration. Our study space is full of different stories, which makes leaving my comfort zone extremely worth it. I thought a lot about what makes me happy. 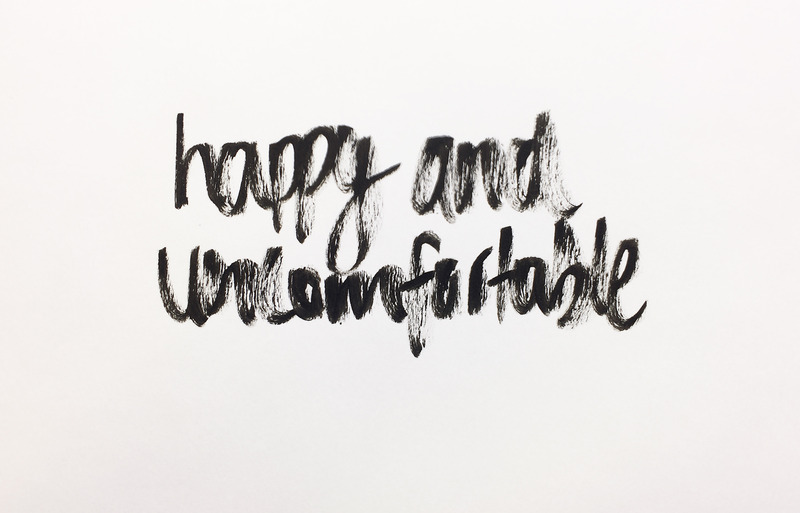 I believe that being uncomfortable creates opportunities for me and that makes me happy. Being uncomfortable can be scary but it also releases new energy. I know I’m exactly where I’m supposed to be. I’m convinced a certain level of uncomfortableness can push you further. I promise you the next challenge is just around the corner and it is going to be very uncomfortable!